While Google is rumored to be working on a YouTube music and video subscription service, it’s already developing its existing site to combat Spotify, Rdio and numerous other music streaming firms. If you head over to the YouTube site and search for a recognized artist, you’ll notice a new section on the right-hand side of the page. By default, it shows a list of their most popular tracks with links to corresponding videos on YouTube. At the top is a thumbnail image, which provides a shortcut to a custom playlist where you can listen to all of the songs back-to-back. Notably, Google is tapping into all of the videos available on YouTube, including unofficial versions that have been uploaded by fans. 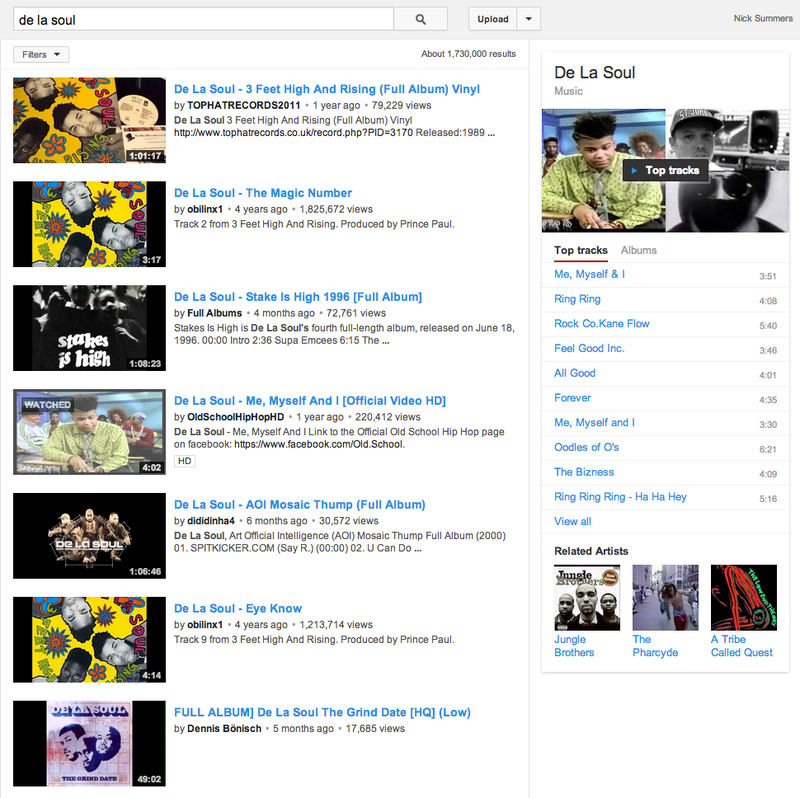 For instance, the ‘top tracks’ playlist for De La Soul – who made its discography free to download today – only features fan-made videos at present. The new music section also has a section for related artists, adding some light discovery features to YouTube, as well as a tab that switches top tracks for a list of their latest albums. Again, if you select one of these links you’ll be given a custom playlist populated with all of the relevant tracks on YouTube. Earlier this month, Google started showing prominent links to music videos at the top of its search results. Although clips from other video-sharing services such as Vimeo and Dailymotion are being handled in a similar fashion, it’s further evidence of Google’s ambition to make YouTube the preferred service for audio and video streaming. Given that Google already has Google Play Music All Access, it’ll be interesting to see how it positions a YouTube-based music and video subscription service, if and when it comes to fruition. Read next: Rakuten’s $900 million strategy is to transform Viber into Line. But it won’t be easy.